Happy Monday everybody! This weeks theme is Red and Green. 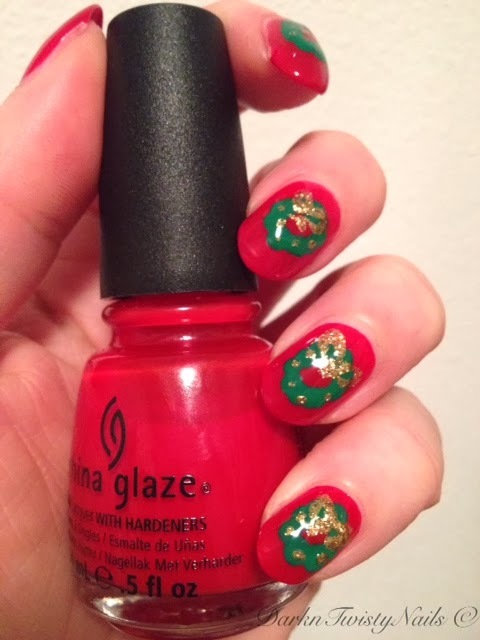 I already did a red and green mani for my #XMASNORULES challenge and because I was a little busy the last few days, I almost did a repeat of that mani. But that felt like cheating and taking the easy way out, so I did do a whole new red and green mani. 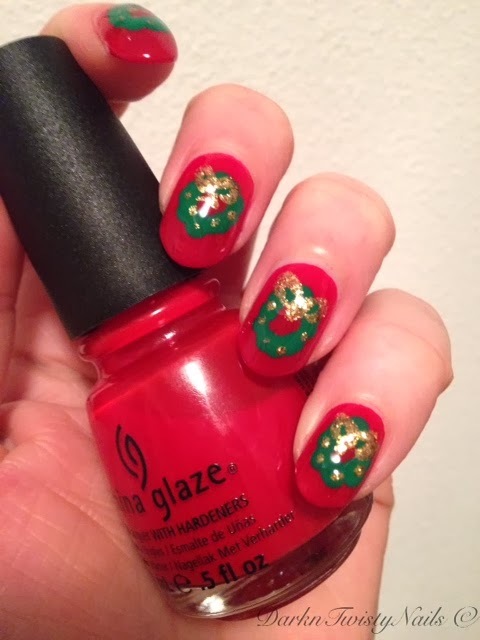 I started with a red base and, to keep the Christmas theme going, added a green wreath with some gold ornaments and a nice gold bow. I think it ended up being a fun Christmas Red and Green mani. We have a great group of Mani Monday's girls, if you'd like to join us, you're more than welcome! Please check out our Facebook page for all the information. Did you do a red and green mani? I'd love to see your creation! Ohhhh....very cute!!! I love it!! Your wreaths are SO nice!! Did you use a dotting tool to make them? LOVE! I did use a dotting tool. I tried freehanding them, but they turned out... well... not looking round enough, lol. So I used my handy dandy dotting tool and that worked perfectly. Dollish Polish 1,2, Freddy's coming for you! Essence Alice had a vision... Again!